It’s been reported that eight out of 10 Americans anticipate stress for the holidays! This may be an ideal time to reflect on whether any stress that you may have is seasonal or ongoing. Chronic stress has a negative impact to health, contributing to serious diseases. This article includes information and resources, including a free app from BCBSMT that can help manage stress year round. As a culture, Americans tend to diminish stress, although this is changing. 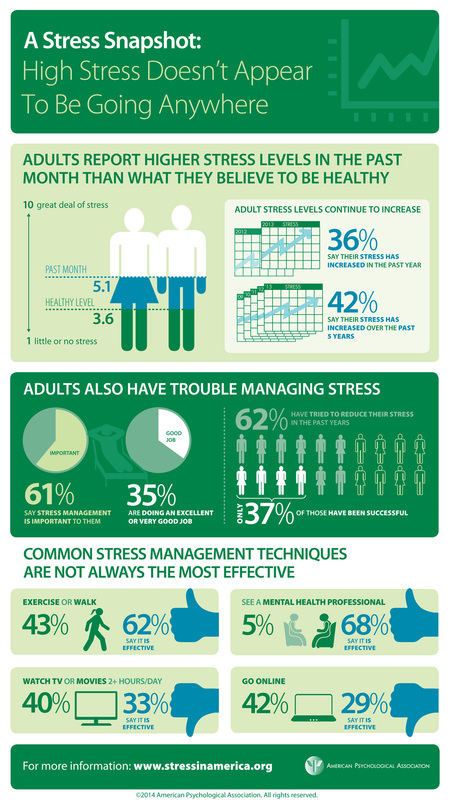 Adults are reporting high stress levels – more than what they believe to be healthy. Caring for an ill loved one, financial hardship, grief, legal difficulties, disabilities and work challenges, especially when coupled with adjectives like enduring, ongoing, long-term, etc., are examples of chronic high stress. These situations don't start on Monday and end on Friday, like moving a family member to an assisted living facility. Movers may do the physical heavy lifting for a few days but who endures the mental equivalent for months? Several government-funded test studies illustrate how chronic stress leads to depression using lab mice and food pellets. To better relate, I simplified (Texas-style) the test scenarios, replacing the mice with two sets of cousins, the Smiths and Joneses, and food pellets with peach cobbler. What happens when the carefree Smiths and the stressed-out Joneses get together shows how added stress further suppresses the Joneses from enjoying the moment. A bump in the road won’t stop the Smiths from savoring the peach cobbler whereas their frazzled cousins, the Joneses, will be much slower to partake in the dessert. And when it comes to the ability to experience pleasure, the Smiths don’t hesitate to drink the sweet tea while the Joneses stick with plain water. The results demonstrate that the Joneses’ chronic high stress prevents neurogenesis or the birth of neurons in a region of the brain called the hippocampus. This hub of the brain is what helps individuals maintain a healthy stress response – a trait of the Smiths on the relaxed side of the family. Without neurogenesis in the hippocampus, life is likely to be, well let’s say a plain water experience (depressed ) and bad for physical health. If you have a health plan that includes behavioral health benefits through BCBSMT, check out the Behavioral Health program information on treatment for depression . You can also download the free Centered App in the iTunes App Store. Centered is a powerful stress management tool that guides you through meditation sessions and records your steps, like a pedometer. Happy to know about this post where i become to learn that at this platform i can play One of the most popular https://scrabblewordfinder.me board game for free and without download.